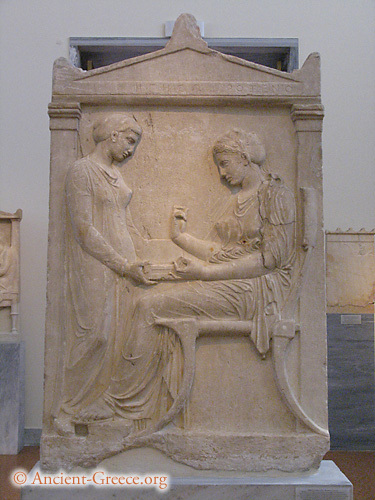 Grave stele of Hegesso, daughter of Proxenos. Hegesso is seated in front of a servant and holds in her right hand a jewel (probably a ring) that she has taken out of the box offered to her. The ring was painted on the stele and it is not visible today. Circa 400 BCE. © 2002- Ancient-Greece.org. All rights reserved.